Aysun Aydemir, an English teacher who gave birth to a baby in an elective caesarean procedure, was detained at the hospital and subsequently arrested by a court and put in pretrial detention with a 3-day-old baby in Zonguldak province as part of a witch-hunt targeting the Gülen group, which the Turkish government accuses of masterminding a coup attempt on July 15, 2016. According to a tweet posted by Republican People’s Party (CHP) İstanbul deputy Sezgin Tanrıkulu, police first started to wait at the door of the delivery room when Aydemir was admitted to the private Ekomar Hospital in the Ereğli district of Zonguldak. After giving birth by caesarean section, she was taken to a room for follow-up treatment. The police detained her and took her to the station despite the fact that she was barely able to walk due to the surgery. Aydemir was subsequently arrested by a court and sent to pretrial detention with her newborn baby. Filiz Y., a 30-year-old woman who gave birth at Mersin City Hospital on Feb. 7, was detained over alleged links to the Gülen group. In late January, Fadime Günay, who gave birth to a baby, was detained by police in Antalya’s Alanya Başkent Hospital as part of an investigation targeting the group. 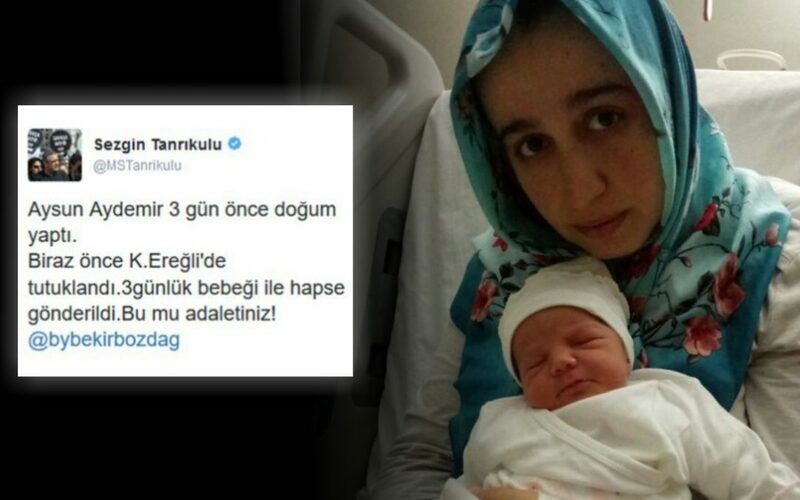 Günay was taken to police headquarters with her one-day-old baby. After her interrogation, she was sent to court with her baby, who was taken by relatives when Günay entered the courtroom. The court ordered Günay to spend one more day in the hospital. In early January, Ş.A., a former private school teacher and mother of a week-old premature infant, was taken into police custody over links to the Gülen group while she was on her way to the hospital to feed the baby. As part of an investigation carried out by Aksaray Public Prosecutor Ayhan Demir, Ş.A. was detained by police and taken to Aksaray from Şanlıurfa province despite the fact that she produced hospital reports saying she should not travel as she had given birth a week earlier by C-section. She also told police officers that her baby was premature and needed to be breast fed and also required special care in the intensive care unit. According to a statement from Interior Minister Süleyman Soylu on April 2, a total of 113,260 people have been detained as part of investigations into the Gülen group since the July 15 coup attempt, while 47,155 were put into pre-trial detention. On May 6 Justice Minister Bozdağ said 149,833 people have been investigated and 48,636 have been jailed as part of investigations targeting the Gülen movement since July 15 of last year.